I’m very bearish Bitcoin - no idea why it’s where it is but Jeez has it gone parabolic ! 5583 as i type 5860 ? previous high - clearly it should visit 6000 ( dollars EACH !) Has anyone tried this trade - is there any real liquidity in it ? How important is Intuition in Trading? It is like another mania. In the end, it will crash. When is the the question. Yes it’s a major one - Like South Sea Bubble and the dot com bubble at the turn of the century. I was going to say Tulipmania, but at least you got a tulip bulb for your house ! This is just numbers on a spreadsheet you are paying Dollars for ! Trouble is you can’t short it because there’s nowhere to put a stop-loss and you can’t buy it because - What are you buying ? So I know the trend traders just keep buying whilst things are rising, but surely there has to be a fundamental value somewhere ? Yes perhaps, so if we go a short, where do we put stop ? 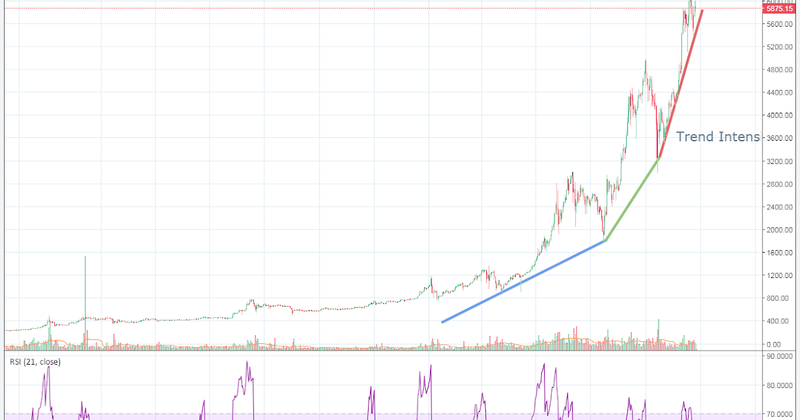 or are you advocating a long with a stop - just because it has gone parabolic ? Trading BTC is insane, buy it and hold it. Sadly I can see the logic of that ! There are (I assume) people out there with significant amounts of “Bitcoin” - can they wander into a car dealership and buy a $5000 car with one ? Can you cash them at a bank ? Bitcoin is still heading higher and staying strong, there could be a pullback at the 6000 level, which could be reached before the end of the year. A few quantitative researchers specialize in FX pairs, commodities and index analysis. Analysing, learning and signal services. It’s hard to say anything about cryptocurrency’s future. Everything depends on demand here. I can understand that people think just buy and hold, but that makes your dollars equivalently vulnerable. There have been some big pullbacks as people took their money out and it is well-known that parabolic rises end in crashes. Bitcoin was a good idea when it started, so sad it will end up defunct ! Honestly, I still think it is a good idea. @Falstaff why do you think it well end up defunct? [Edit - Paper money has nothing to back it except belief which is - how much more vulnerable then is "money in a spreadsheet somewhere " ? As a medium of exchange which it started out as, an “Under the Radar” way of swapping your labour and goods for those of others, it was fine. As a “Collector’s piece”, a parabolic speculator’s vehicle it is simply Pyramid selling. Pyramid selling as such is illegal in most countries, precisely because it is unsustainable in the long term. I hope all of you calling for a Bitcoin crash have not found a way to short this. Bitcoin is again at new all-time highs and is up 40% from Oct 14th the first post on this thread. Price Action cares nothing about your opinion on bubbles or pyramid schemes, the price will go up as long as there is more demand than supply. Bitcoin is again at new all-time highs and is up 40% from Oct 14th the first post on this thread. Price Action cares nothing about your opinion on bubbles or pyramid schemes, the price will go up as long as there is more demand than supply. How will you know when to get out ? Yeah, I’ve read guys waiting for 5000 to buy. Most younger guys yawn when it comes to history, NSQ this time of year 3000 after a pull back from 2800 down to 2200. The rise was attributed to demand etc, and that was true. The talks was 6000, was very achievable, nobody cared for the nay sayers - the emperor was def clothed. 6000 came and went, the new year euphoria took it to over 6500 - then a little kid shouted out, finger pointed. By coincidence the techs are back there, good chance 6800 by Feb 2018. Wouldn’t it be funny if that same little kid came out from the crowd around then, then again does history (yawn) ever repeat?